The SCAP plan has been created by WRAP which is an organisation which delivers practical solutions to improve resource efficiency. There mission and vision is to accelerate the move to a resource efficient economy. They drive change in the fashion and textile industry to reinvent, rethink and redesign there products and clothing. It is also created to educate consumers on how to elongate the clothing’s lifecycle. By rethinking and reinventing clothing means producing products to reduce carbon, waste and water. Rethinking clothing is done by adding value and ensuring an elongated product lifecycle is built in. Whilst revauling clothing allows changes to maximise the benefits from reusing old clothing and recycling. As the governments plan is to reduce waste and increase the reuse of clothing; the SCAP plan is put in place to educate both retailers and consumers in how we can elongate our clothing and rethink its creation and purpose. The continuous research which runs along side the SCAP missions change through further development of technologies and processes. 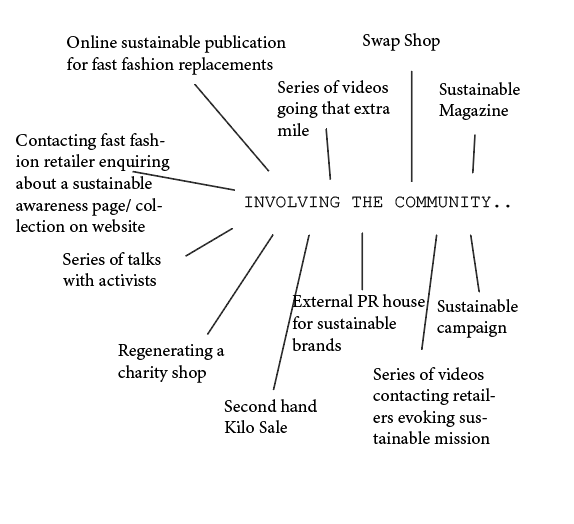 Fashion revolution is a global movement which raises awareness about the fashion industrys most pressing issues. 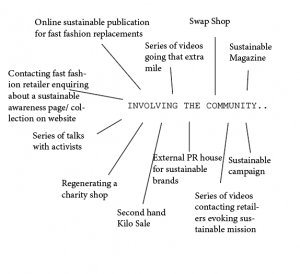 They encourage sustainable and ethical change for the future of fashion. They are a group of individuals with different occupatios including designers, academics, writers, business leaders, policymakers, brands, retailers, marketers, producers, makers, workers and fashion lovers. They strive for many individuals to get on board as this is the only way postitive change to our people and the environment will happen. They want to ensure that sourcing, production and consumption of clothing is safe, clean and fair. There approach for change is making individuals aware of what goes on by recognising that they are the only individual who can create change for themselves and others. Instead of boycotting and victimising, naming and shaming there approach is fair and justified. As the fashion industry as a whole has a part to play in the the unsustainable factors of fashion they do not target one company’s actions. By conforming to a circular economy increases the longetivity and regeneration of products. It allows sustainable product designs to be created however retailers will need to work on there production, consumption,waste management and the use of raw materials. Part of a circular product means building waste into the life cycle which can be regenerated into something new. In order to do this a selection of low impact materials will be needed whilst reducing the amount that are used. Although it is important that production techniques and distruibution systems are optimised in order for harmful gases to be released. All life cycles entail a reduction of impact during use, optimisation of initial lifetime, optimisation of end of life system, and new concept development for products. Therefore with a circular fashion industry shows a promising future for our earth and people as it will prevent resource efficiency, reduction in our carbon footprint, non toxicity, biodegradability, recyclability and good ethics. 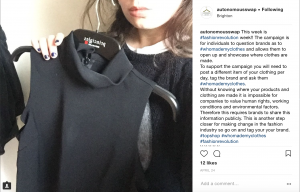 It is important we find ways in which we can become more conscious in the decision we make when purchasing clothings, this can range from shopping second hand, borrowing clothing, lease/ renting clothing, shopping in charity shops. This way unnecessary clothing is wasted and waste is minimised which contributes to a slower fashion movement. Clothing is a way of one showing there social identity and personality which may conform to a particular stereotype in the way they would like to be perceived. An influencer of creating this social identity may be constant trend change which individuals feel the need to respond to in order to maintain a particular current and on trend image. This contributes as to why fast fashion has been built to be perceived as throw away. Maintaining a particular aesthetic through clothing embodies a social and structural identity which categorises individuals. Please see sketchbook for more information. I have become more sustainably aware over the course of my three years at university through living in Brighton. Brighton has such a strong eco community which has enabled me to learn a lot about second hand fashions, plant base eating, waste reduction and self meditation. Prior to this I had false interpretation as to what healthy living was, which is actually very unsustainable. Through consumption of animal base products and looking down at charity shops as they were ‘someone elses trashy hand me downs’ I have managed to find my in what does good for our planet. Therefore I intend to respond to the mission of sustainable living through educating individuals on the small changes they can do to benefit both their lives and maintain our planets environment. My aim is to start by targeting my friends, especially the 7 girls I live with who love cheap buys from Boohoo and Missguided. At least 3 of them make a large order from a fast fashion retailer per week which is what they like to spend their disposable income on. I started to question myself due to being the age of 20 and never shopping in a cheap online retailer (boohoo, missguided, prettylittlething) which seemed to be very rare through discussions with friends and Brighton university students. Therefore my first line of discussion was why do they contribute to the fast fashion industry? Are they aware of where there clothes come from? Is it quantity over quality? What encourages them to shop at these stores? Do they think it is normal that I have never purchased anything from these stores? Do they ever shop second hand? As a base to my research I looked at what I could do to help evoke a sustainable research through fashion and wellbeing and came up with ideas surrounding educating individuals in what they purchase and the impacts it can have on our planet, animals and people. 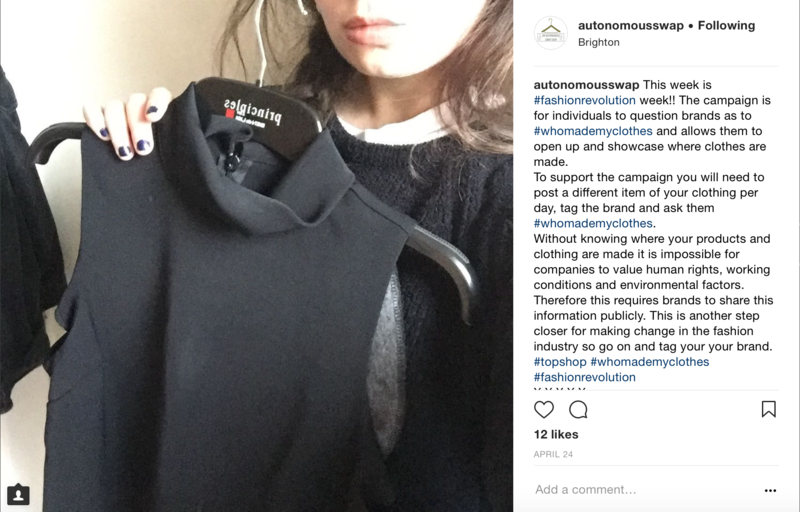 As Brighton has such a large eco community due to vegan shops and a large second hand fashion culture, reducing waste e.t.c primal focus was on this to trigger ideas in way we can attract students who love to shop in fast fashion to expand there knowledge and interest of what goes on behind closed doors.